Transparent, colorless rossmanite from Elba, Italy, capped with black foitite on top of fractured elbaite. Image courtesy of Fredrico Pezzotta, Milan, Italy. Kutzschbach M, Wunder B, Krstulovic M, Ertl A, Trumbull R, Rocholl A, Giester G. (2017) First high-pressure synthesis of rossmanitic tourmaline and evidence for the incorporation of Li at the X site. 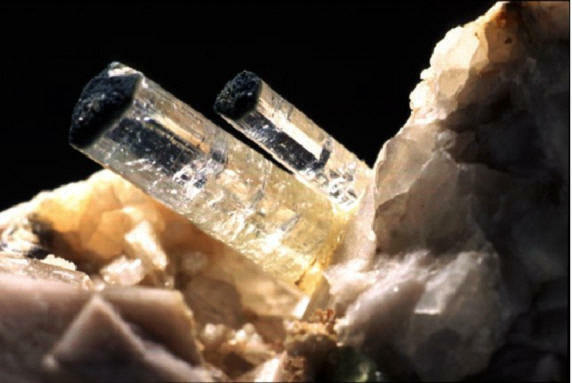 Physics and Chemistry of Minerals 44, 353-363.